Inca Government - HISTORY'S HISTORIESYou are history. We are the future. Government: ​How are societies organized and why are they organized the way they are? Review: Who is the Sapa Inca? What ​rights did common people of the Inca empire have? The Inca did not call themselves the Inca. They actually called themselves the Tawantin Suyu, which means the "Four United Regions," or "Land of the Four Quarters." By 1500 CE, the Inca Empire was huge. It stretched for 2500 miles from the north to the south and had a population of around 12 million people. ​In order to manage and maintain such a large empire, the Inca needed a sophisticated and organized government. Because the Inca empire was so large, its government was large as well. Eventually 40,000 people worked in Inca government. They collected taxes, enforced Inca law, supervised building projects, directed the military, and controlled the lives of their 12 million Inca subjects who spoke over 20 different languages. 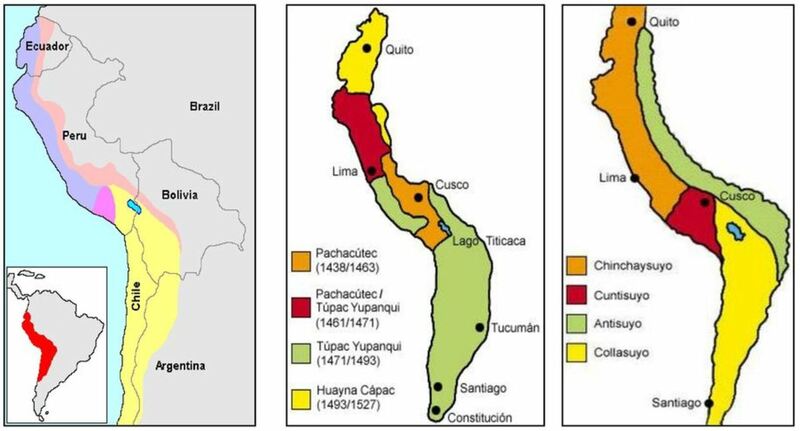 Left to Right: The extent of the Inca empire, Expansion of the empire under 4 powerful Inca leaders, and Tawantinsuyu, or the Four United Regions. Indeed, the Inca had a remarkable form of government. The Inca government, also called Tawantin Suyu, was a monarchy ruled by a single leader - a powerful king. Because the Inca king ruled over an empire, he was also known as an emperor. The leader of the Inca empire was called the Sapa Inca, which means "sole ruler." He was the most powerful person in the land and everyone else reported to the Sapa Inca. The Sapa Inca was the head of government and everyone, from the commoners to the Inca elite, worked for the state. Really, that means they worked for the Sapa Inca. In return, the state looked after everyone. When times were tough or people retired, the state took care of them. Tight government controls kept the people fed, clothed, and housed for life. Because the government controlled all aspects of one's life, however, some might argue that those same tight controls also kept the people enslaved. Despite their limited freedom, the people never rose up and fought against this system of government. As you will see later, there were reasons for that. According to Inca myth, the capital city of Cuzco was the center of the universe. From it's location to its shape (The outline of Cuzco is shaped like a panther), all things about the city are of cosmic importance to the Inca. It was the home of the sun god, Inti, and like rays from the sun, the life of the Inca empire radiated from its core. In reality, Cuzco was both the home of the Inca government and the heart of the empire. It was situated about 11,000 feet above sea level high in the Andes Mountains. ​Who ​lived in the capital city? At its peak, Cuzco had a population of about 40,000 people, with another 200,000 farmers and artisans living in the nearby countryside. Residence in the city was reserved for the Inca elite and those who served in the higher offices of government, as well as their families and servants. Commoners, who were mostly farmers, lived outside of Inca cities, near their crops and huge storage facilities. Within Cuzco's walls, there were palaces, temples, schools, houses, and government buildings. The city also had sacred gardens filled with exotic herbs, trees, and flowers. There was a huge public square for ceremonies and gatherings, which the Sapa Inca would observe from his carved stone throne. The streets of Cuzco were paved. Because the Inca did not have wheeled vehicles, however, the streets were extremely narrow. Aqueducts brought fresh water in to the city to supply the palaces. Cuzco's most spectacular building of all was the famed Coricancha, or Temple of the Sun, built to honor the Inca sun god, Inti. The Coricancha was covered in gold and studded with emeralds. It stood in the center of the city. The temple had six chapels built around a central courtyard. The Inca were master builders and most of Cuzco's buildings were made of stone. Inca stonework is unique in that each piece of stone is of irregular shape. Even so, without the use of mortar, each stone is perfectly set. Because of that, Inca stonework is still regarded as some of the best in the world. Building stones were quarried in the mountains. Thousands of men were organized to hack out enormous blocks of stone and transport them to building sites. Only Inca nobles and their families lived in Cuzco. The city was always under construction. Each emperor ordered a new palace to be built for his use. They had to, actually, as the palaces of the former Inca were still in use. When a former Inca died, he was not buried. His body was mummified and returned to his palace. There, his family and servants waited on him just as if he were still alive. Cuzco was a beautiful and busy place. Messengers traveled back and forth with news from across the empire. Armies, engineers, priests, and administrators arrived and left again, traveling to wherever they were needed in the empire. Llama trains arrived with loads of food and goods. There were religious celebrations every month. A massive fortress guarded the city, and you had to pass through a huge tollgate to enter the city. The gateway guards checked everyone who came and went. The guards noted everything coming in, and they made sure nothing precious was removed from the city without permission. What ​group made up most of the population in the Inca empire? Most of the people in the Inca empire were farmers. They lived in farming communities and would probably never see the capital of Cuzco. The only people who actually lived in or just outside the city were the artisans who made artwork for the temples. People who lived nearby might travel into town for festivals or business, but the city was mainly used for government. The city of Cuzco has many names. Some people spell it Cusco. The people who live in the modern-day city of Cuzco seem to prefer the name Qosqo. Still others call it Qusqu. It’s confusing, but however you spell it, Cuzco was the heart of the Inca empire. It was the home of the ruling Sapa Inca as well as the home of all former Inca who each lived in their respective palaces, surrounded by family, servants, and aides. The Sapa Inca was the supreme ruler of the Inca people and Cuzco was the home of the Inca government, but who really ran the government? How did the Sapa Inca rule 12 million people all by himself? That’s easy. He didn’t. The Sapa Inca organized his government like a pyramid. Of course, the Sapa Inca stood alone at the top of the pyramid. The Sapa Inca was all-powerful. Not only did the Sapa Inca rule everything, just like the pharaoh in ancient Egypt, he owned everything. The Sapa Inca made all the laws. Everything was the responsibility of the Sapa Inca, and nothing could be done until the Sapa Inca approved it. The Inca ruler was powerful because the people believed he was descended from the sun god, Inti. How ​was the Inca government organized? Directly under the Sapa Inca, there were four apos, or officials, who formed the Sapa Inca's "Supreme Council." Each apo was in charge of one-quarter of the empire. The Inca divided their empire into four suyus, or quarters, that radiated from Cuzco, the capital city. The apos were usually close relatives of the Sapa Inca. The four quarters they ruled were divided into regions, or provinces. In all, there were eighty provinces, and each province had about twenty thousand households. A governor oversaw each province and reported to the apo of his quarter. Except for the Sapa Inca and the four members of the supreme council, the provincial governors were the most powerful political leaders in the Inca empire. There was mathematical order to how the provinces were run. Today, we call this kind of order and organization a hierarchy. In a hierarchy workers are assigned to perform specific tasks. A hierarchy is organized so that workers report to someone above them and are in charge of workers below them. Governments, large businesses, and even schools are ordered hierarchically. 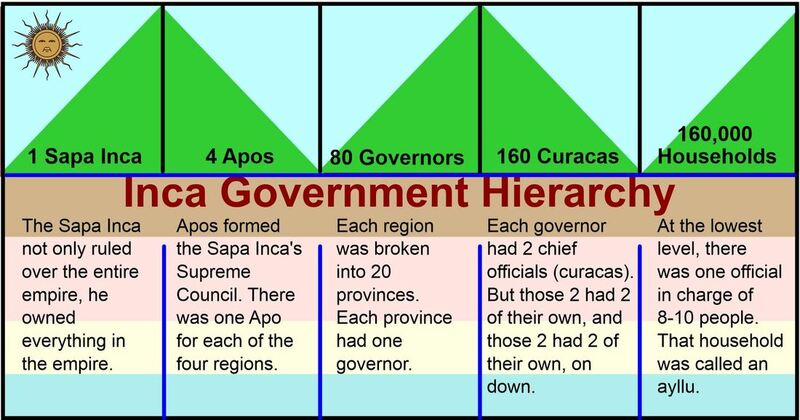 In the hierarchy of the Inca government, there were two top-level curacas (officials, or administrators) in each province; each of them oversaw 10,000 households and reported to the provincial governor who was responsible for all 20,000 households. Those two curacas (officials, or administrators) were each in charge of ten curacas, each of whom oversaw 1,000 households. Under each of these ten curacas were two more, each in charge of 500 households. Under each of them there were five curacas who were each in charge of 100 households. At the lowest level, an official oversaw the work of 8-10 people. Tax collectors were an important part of Inca government. Brainbox: Why ​were tax collectors important to the Inca empire's success? Officials in the Inca empire included army officers, priests, judges, and tax collectors. Most officials came from the noble class. These individuals could ride in a litter and had other special privileges not enjoyed by the general population. Tax collectors played an especially important part in the Inca government. Because the Sapa Inca - in other words, the government - not only owned everything in the empire but also promised to take care of the needs of the population, there was a lot to keep track of. Tax collectors were in charge of counting the number of workers, as well as how much they worked and how much they produced with their labor. With nearly 12 million people to track, that was a lot of counting. There were several levels of tax collectors. There was one tax collector for every ayllu (family group). That tax collector reported to a collector higher up the scale who might be in charge of several tax collectors and so on. Their rung on the social scale was measured accordingly. Commoners were always working - and being watched. What ​freedoms were enjoyed by common people in the Inca empire? At the bottom of the pyramid were the workers. Most of the people in the Inca empire were workers. The conquered workers were the lowest people in the Inca hierarchy. Workers were organized into family units called ayllus. The ayllu was made up of a number of families - perhaps 10 -20 people - and often acted like a large family. Land was assigned by the government to each ayllu based on the number of people in the group. Common people had no freedom. They could not own or run a business. They could not own luxury goods. The only items common people could have in their homes were things they needed to do their job. They could not even travel on the roads. Only a small amount of time was allotted for bathing and eating. Life was not all work, however. The Inca people had lots of religious holidays that gave workers a break from their labor. Common people, however, could not be idle. That was the law. They could only be celebrating a state-approved holiday, working in the fields, or sleeping. Of course, in exchange for their work they were looked after. From cradle to grave, all of the needs of Inca workers were taken care of by the government. It is estimated that for every 10,000 workers in the Inca empire there were about 1,300 officials overseeing them. That means that there was one administrator for about every 8 workers. Talk about BIG government! Quipus were used to record things like trade and taxes. What ​was the Inca service tax? The Inca loved gold and silver, but they had no use for money. Because the Inca had no money, taxes were usually paid in food or in commodities. Agricultural land and herds were divided into three parts. 1/3 of a farmer or herder's production went directly to support the state religion and the gods. Another 1/3 was reserved for the Inca ruler. The workers got to keep the remaining 1/3 for their family and their ayllu's own use. In addition to corn, potatoes, and dried meat, Inca tax-men would collect precious metals, wool, cotton, textiles, exotic feathers, and dyes. However, taxes could also be collected in the form of labor. To keep track of all these statistics the Inca used the quipu, a sophisticated assembly of knots and strings which was also highly transportable and could record decimals up to 10,000. Local communities were expected to help build and maintain imperial projects such as the construction of roads, bridges, storehouses, and temples. Roads were especially important. Goods were transported across the empire along purpose-built roads using llamas and porters (there were no wheeled vehicles). The Inca road network covered over 25,000 miles. Inca roads made it easy for armies and administrators to quickly reach any part of the empire. Of course, the roads were also a powerful visual symbol of the Sapa Inca's authority over his empire. The Mi'ta was a tax paid in hours of labor. How ​was the Inca service tax paid? In addition to food and commodities, every male worker between the ages of 16 and 60 had to pay an additional service tax called a Mi'ta for the privilege of doing his or her job. Mit'a obligations were over and above the farming requirements for the state. This tax was paid in labor - in billions of man-hours. That is how the Inca were able to rise to power and to build an empire so rapidly. Each year, every common man in the empire worked off his Mi'ta by serving in the army, in the mines, or in construction - building roads, temples, and palaces. When a person left to work on a government project, other members of his ayllu would take over his work on the farm. Brainbox: Why ​was their so little crime in the Inca empire? The Inca had laws to regulate almost every aspect of the daily life of the common people. Inca nobles had a different set of laws to live by but were by no means exempt from Inca law and order. There were laws about what kinds of crops people could grow and what kind of clothes to wear. Women were responsible for the cleanliness of their homes, and homes were inspected to ensure that they met a certain standard. If a household had not been kept up properly, the woman who lived there was forced to eat dirt from her house with the whole village watching. The man of the household was often included in the punishment as well, probably for not having managed his wife better. There was almost no crime in the Inca empire and, coincidentally, there were apparently no prisons either. Inca laws were very harsh and punishment was swift, so few people committed crimes. Usually, workers were just too busy - and exhausted - to find time to get into trouble. However, when a crime was committed, the government quickly went to work punishing the criminal. What ​was the purpose of the begging bowl? The government imposed a physical punishment for some crimes. If the crime was damaging government property, for instance, law enforcement officials would drop a large rock on the guilty party's back from a height of 3 feet. Stealing was punishable by whipping for a first offense. Repeat offenders, however, could have their hands or feet cut off or their eyes gouged out, or they would be hung by their feet until they died. If you insulted the Sapa Inca, cursed the gods, or committed a murder, you were thrown off a cliff. Other crimes led the offender to be hung over a cliff to be eaten by birds. A person who committed treason was thrown into a pit full of snakes and ferocious wild animals. Brainbox: What ​do you think was the most effective crime and punishment measure taken by the Inca empire? When the Inca conquered another tribe, the Sapa Inca didn’t want the people they conquered to have too much power, but expanding the military and keeping soldiers in conquered areas would be too expensive. 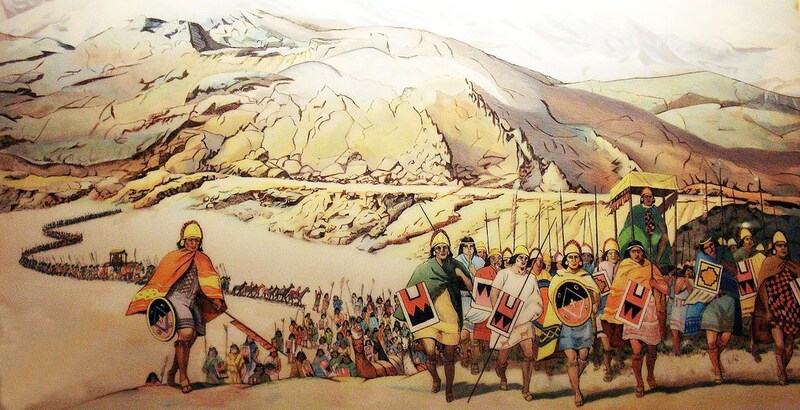 Instead of keeping a permanent military presence in their new territories, the Inca made the leaders of conquered areas move out of their villages. Then they brought in new leaders who were loyal to the Inca government. The Inca also made the children of conquered leaders travel to the capital to learn about Inca government and religion. After awhile, the children went back to rule their villages, where they taught people the Inca way of life. The Inca government knew that to control their empire they had to communicate with the people. But the people, spread over vast distances, spoke many different languages. To unify their empire, the Inca government established an official language, Quechua (KE-chuh-wuh). All official business had to be done in that language. Inca warfare was fought hand to hand at close quarters, Most of their weapons were of the club variety, but they also made used of slings and bolas. Brainbox: Why ​was conquest important to the Inca empire?